We’ve used packages from crates.io as dependencies of our project, but you can also share your code with other people by publishing your own packages. The crate registry at crates.io distributes the source code of your packages, so it primarily hosts code that is open source. Rust and Cargo have features that help make your published package easier for people to use and to find in the first place. We’ll talk about some of these features next and then explain how to publish a package. Accurately documenting your packages will help other users know how and when to use them, so it’s worth investing the time to write documentation. In Chapter 3, we discussed how to comment Rust code using two slashes, //. Rust also has a particular kind of comment for documentation, known conveniently as a documentation comment, that will generate HTML documentation. The HTML displays the contents of documentation comments for public API items intended for programmers interested in knowing how to use your crate as opposed to how your crate is implemented. Here, we give a description of what the add_one function does, start a section with the heading Examples, and then provide code that demonstrates how to use the add_one function. We can generate the HTML documentation from this documentation comment by running cargo doc. This command runs the rustdoc tool distributed with Rust and puts the generated HTML documentation in the target/doc directory. Panics: The scenarios in which the function being documented could panic. Callers of the function who don’t want their programs to panic should make sure they don’t call the function in these situations. Errors: If the function returns a Result, describing the kinds of errors that might occur and what conditions might cause those errors to be returned can be helpful to callers so they can write code to handle the different kinds of errors in different ways. Safety: If the function is unsafe to call (we discuss unsafety in Chapter 19), there should be a section explaining why the function is unsafe and covering the invariants that the function expects callers to uphold. Most documentation comments don’t need all of these sections, but this is a good checklist to remind you of the aspects of your code that people calling your code will be interested in knowing about. Now if we change either the function or the example so the assert_eq! in the example panics and run cargo test again, we’ll see that the doc tests catch that the example and the code are out of sync with each other! Another style of doc comment, //!, adds documentation to the item that contains the comments rather than adding documentation to the items following the comments. We typically use these doc comments inside the crate root file (src/lib.rs by convention) or inside a module to document the crate or the module as a whole. Notice there isn’t any code after the last line that begins with //!. Because we started the comments with //! instead of ///, we’re documenting the item that contains this comment rather than an item that follows this comment. In this case, the item that contains this comment is the src/lib.rs file, which is the crate root. These comments describe the entire crate. 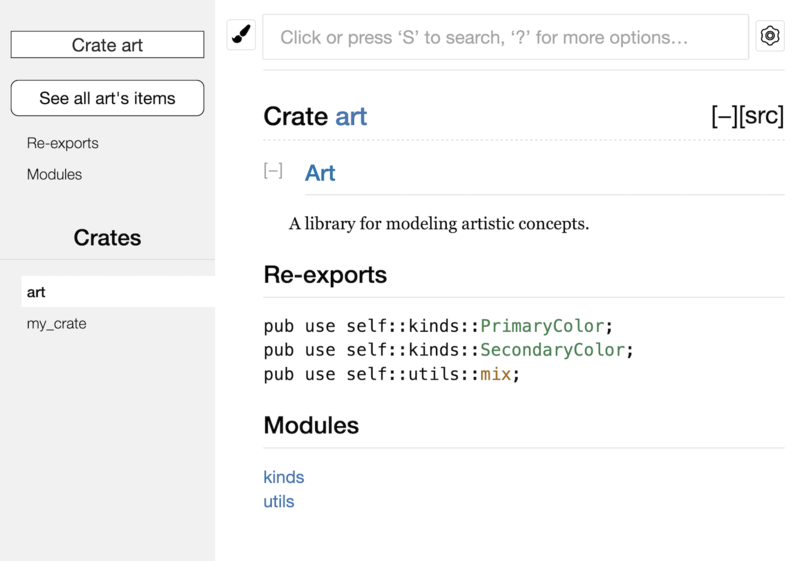 Documentation comments within items are useful for describing crates and modules especially. Use them to explain the overall purpose of the container to help your users understand the crate’s organization. In Chapter 7, we covered how to organize our code into modules using the mod keyword, how to make items public using the pub keyword, and how to bring items into a scope with the use keyword. However, the structure that makes sense to you while you’re developing a crate might not be very convenient for your users. You might want to organize your structs in a hierarchy containing multiple levels, but then people who want to use a type you’ve defined deep in the hierarchy might have trouble finding out that type exists. They might also be annoyed at having to enter use my_crate::some_module::another_module::UsefulType; rather than use my_crate::UsefulType;. The structure of your public API is a major consideration when publishing a crate. People who use your crate are less familiar with the structure than you are and might have difficulty finding the pieces they want to use if your crate has a large module hierarchy. The good news is that if the structure isn’t convenient for others to use from another library, you don’t have to rearrange your internal organization: instead, you can re-export items to make a public structure that’s different from your private structure by using pub use. Re-exporting takes a public item in one location and makes it public in another location, as if it were defined in the other location instead. //! A library for modeling artistic concepts. /// The primary colors according to the RYB color model. /// The secondary colors according to the RYB color model. Note that the PrimaryColor and SecondaryColor types aren’t listed on the front page, nor is the mix function. We have to click kinds and utils to see them. The author of the code in Listing 14-4, which uses the art crate, had to figure out that PrimaryColor is in the kinds module and mix is in the utils module. 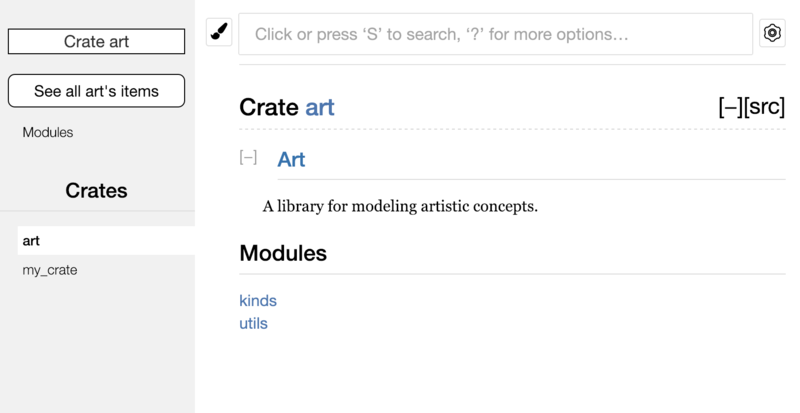 The module structure of the art crate is more relevant to developers working on the art crate than to developers using the art crate. The internal structure that organizes parts of the crate into the kinds module and the utils module doesn’t contain any useful information for someone trying to understand how to use the art crate. Instead, the art crate’s module structure causes confusion because developers have to figure out where to look, and the structure is inconvenient because developers must specify the module names in the use statements. The API documentation that cargo doc generates for this crate will now list and link re-exports on the front page, as shown in Figure 14-4, making the PrimaryColor and SecondaryColor types and the mix function easier to find. In cases where there are many nested modules, re-exporting the types at the top level with pub use can make a significant difference in the experience of people who use the crate. Creating a useful public API structure is more of an art than a science, and you can iterate to find the API that works best for your users. Choosing pub use gives you flexibility in how you structure your crate internally and decouples that internal structure from what you present to your users. Look at some of the code of crates you’ve installed to see if their internal structure differs from their public API. This command will inform Cargo of your API token and store it locally in ~/.cargo/credentials. Note that this token is a secret: do not share it with anyone else. If you do share it with anyone for any reason, you should revoke it and generate a new token on crates.io. Now that you have an account, let’s say you have a crate you want to publish. Before publishing, you’ll need to add some metadata to your crate by adding it to the [package] section of the crate’s Cargo.toml file. error: api errors: missing or empty metadata fields: description, license. The reason is that you’re missing some crucial information: a description and license are required so people will know what your crate does and under what terms they can use it. To rectify this error, you need to include this information in the Cargo.toml file. If you want to use a license that doesn’t appear in the SPDX, you need to place the text of that license in a file, include the file in your project, and then use license-file to specify the name of that file instead of using the license key. Guidance on which license is appropriate for your project is beyond the scope of this book. Many people in the Rust community license their projects in the same way as Rust by using a dual license of MIT OR Apache-2.0. This practice demonstrates that you can also specify multiple license identifiers separated by OR to have multiple licenses for your project. description = "A fun game where you guess what number the computer has chosen." Cargo’s documentation describes other metadata you can specify to ensure others can discover and use your crate more easily. Now that you’ve created an account, saved your API token, chosen a name for your crate, and specified the required metadata, you’re ready to publish! Publishing a crate uploads a specific version to crates.io for others to use. Be careful when publishing a crate because a publish is permanent. The version can never be overwritten, and the code cannot be deleted. One major goal of crates.io is to act as a permanent archive of code so that builds of all projects that depend on crates from crates.io will continue to work. Allowing version deletions would make fulfilling that goal impossible. However, there is no limit to the number of crate versions you can publish. Congratulations! 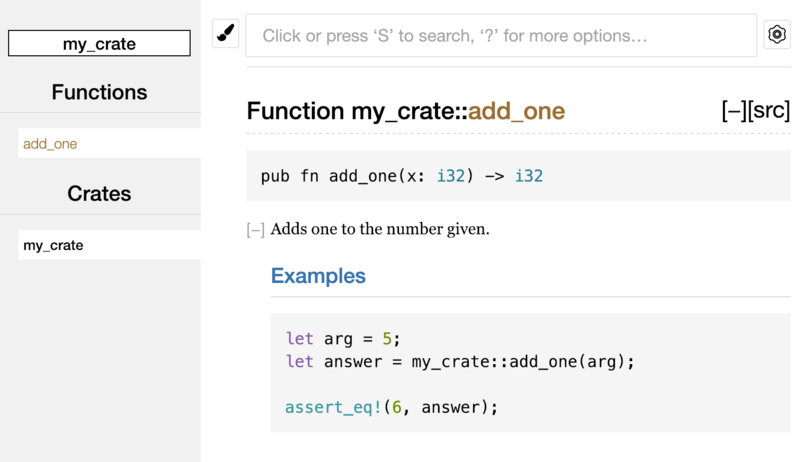 You’ve now shared your code with the Rust community, and anyone can easily add your crate as a dependency of their project. When you’ve made changes to your crate and are ready to release a new version, you change the version value specified in your Cargo.toml file and republish. Use the Semantic Versioning rules to decide what an appropriate next version number is based on the kinds of changes you’ve made. Then run cargo publish to upload the new version. Although you can’t remove previous versions of a crate, you can prevent any future projects from adding them as a new dependency. This is useful when a crate version is broken for one reason or another. In such situations, Cargo supports yanking a crate version. Yanking a version prevents new projects from starting to depend on that version while allowing all existing projects that depend on it to continue to download and depend on that version. Essentially, a yank means that all projects with a Cargo.lock will not break, and any future Cargo.lock files generated will not use the yanked version. A yank does not delete any code. For example, the yank feature is not intended for deleting accidentally uploaded secrets. If that happens, you must reset those secrets immediately.